(November 13, 2012) A new documentary asks whether celebrity-led crusades to relieve poverty and hunger, such as Bob Geldof’s Live Aid mega-concerts in the 1980s, have actually made a difference. A documentary on famine in Ethiopia inspired Bob Geldof to corral his famous friends to record the charity single “Do They Know It’s Christmas?” He would enlist their help again for Live Aid’s dual fund-raising concerts in London and Philadelphia in July 1985, once more in support of relief for Ethiopia. “Give Us the Money: From Live Aid to Make Poverty History,” a documentary on the era of super-celebrity charity events and philanthropic foundations, premiered in North America on November 21, at Toronto’s Bloor Hot Docs Cinema. 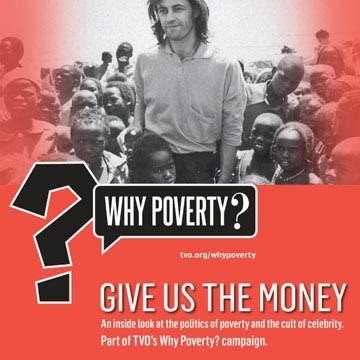 Presented by Ontario public broadcaster TVO as part of its Doc Studio Screening Series, “Give Us the Money” riffs on a catchphrase made famous by musician Bob Geldof during an interview promoting the 1985 Live Aid concert phenomenon he helped organize to raise funds for famine relief in Ethiopia. Massive star-powered events on this scale have generated enormous sums in the fight against hunger and poverty – the original Live Aid concerts alone raised more than £100 million – but decades later, hunger and poverty remain problems of the present. A trailer for “Give Us the Money,” directed by Swedish radio and television writer/producer Bosse Lindquist, is available here to view. “Give Us the Money” was also broadcast by TVO on Sunday, November 25.